Making a cake is not a difficult process, but complications can arise whether you are using a premixed product or baking the cake from scratch. By altering the ingredients, however, you can eliminate a number of potential pitfalls that lead to a cake being dry and crumbly when it comes out of the oven. In some cases, making substitutions or adding one additional element is all you need to make a extremely moist and flavorful cake. Add one box of instant pudding mix to the recipe's dry ingredients and stir. Pudding provides stability to the ingredients and changes the texture of the cake to make it smooth and moist. Use a pudding flavor that complements that cake. For example, if you are baking a chocolate cake, select chocolate pudding mix. Alternatively, you can select a pudding flavor that adds to the cake; for example, pair a mint pudding with chocolate cake. Separate the white from the yolk of one egg included in the recipe. Discard the white and add only the yolk to the batter. This step is necessary for only one egg, regardless of how many are used in the recipe. Egg whites are drying agents and too many will reduce the moisture content of the batter. Add an extra 1/3 cup vegetable oil to the batter and stir. Vegetable oil reduces the production of gluten in flour, a protein found in wheat products that works as a binding agent. Too much gluten in a cake will cause it to be sticky rather than moist. Use real butter in place of margarine, even if the recipe calls for it. 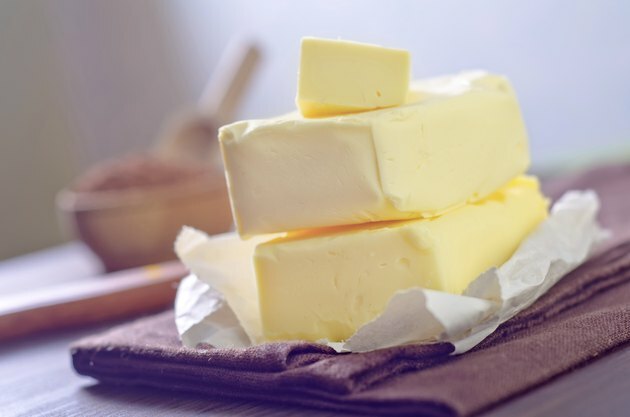 Margarine or butter substitutes contain more water than fat. However, it is the fat in butter that helps to hold the cake together and moisten it. The excess water in margarine will evaporate in the oven's heat, leaving you with a dry texture to your cake. Blend the batter throughly after adding any additional ingredients called for in the recipe to ensure their full incorporation and then bake the cake normally. It is not necessary to use each step to moisten your cake. Select any one or combination of changes to create a luxurious texture for the batter. As an alternative to instant pudding, use a pouch of dry dairy topping mix. What Happens If You Don't Put Enough Eggs in Cake Mix?